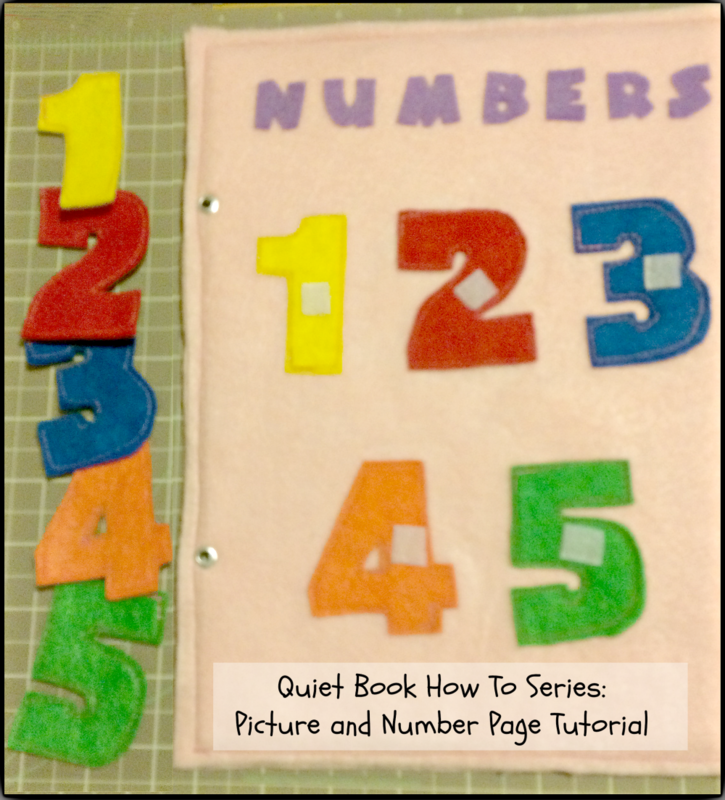 This is the second part of the Quiet Book How To Series. 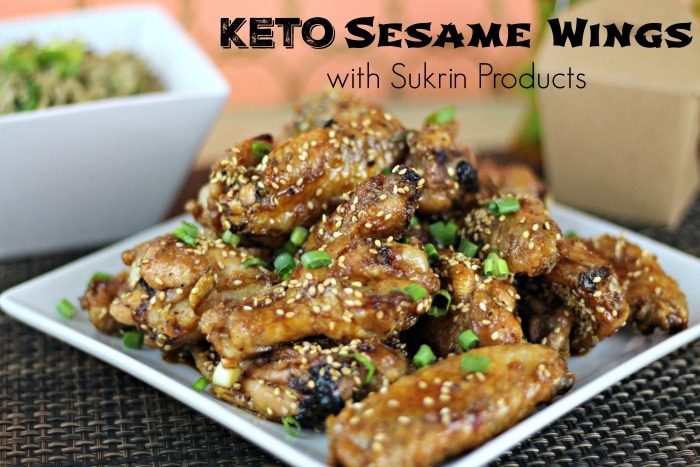 You can check out my post on the Title Page to get instructions on how to make it. From now on we will be making two pages, a front and back. For the front of the page I wanted a "This Book Belongs To.." Page with my daughters picture. For the back page I wanted a numbers page where she can pull off the numbers and match them to the page. 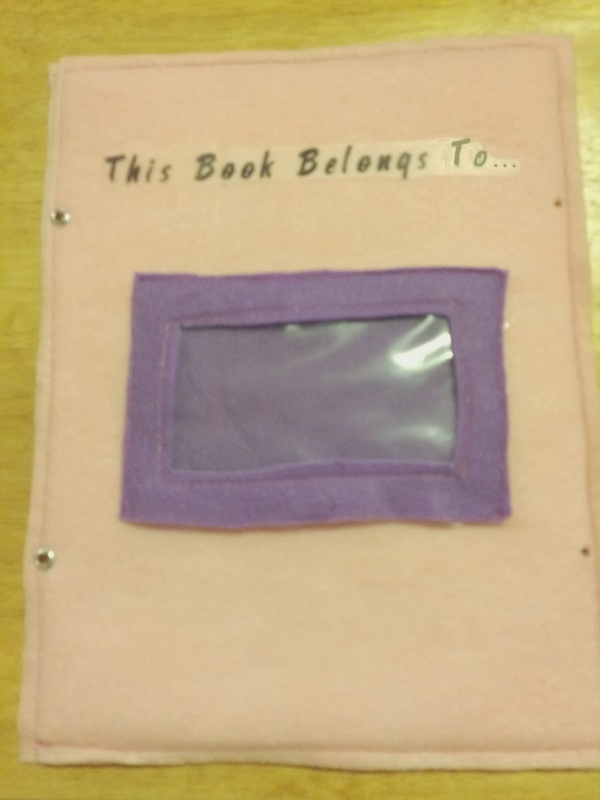 Print out the "This Book Belongs to.." printable onto iron on transfer paper. Iron onto pink felt sheet on the top part of the page. I went about 3 inches down from the top. 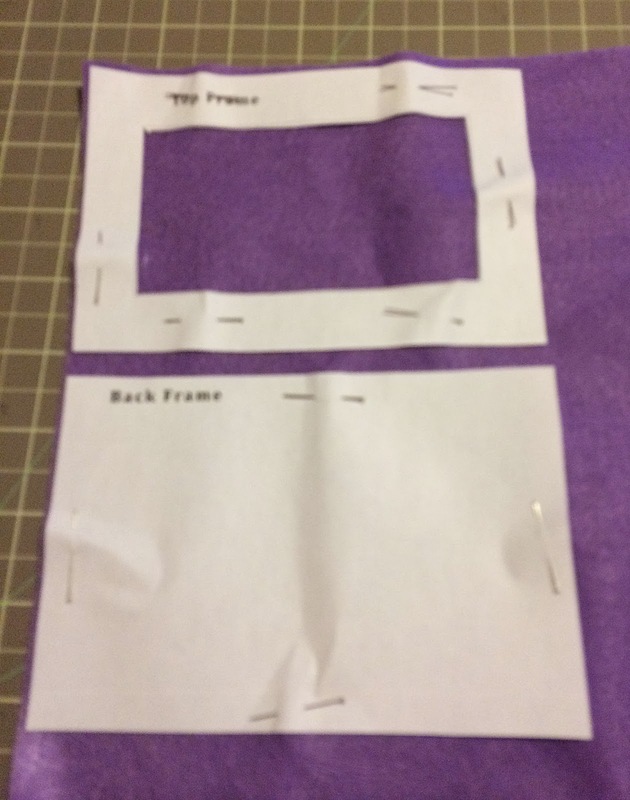 Cut out the template and pin to the purple felt. Cut out frame. 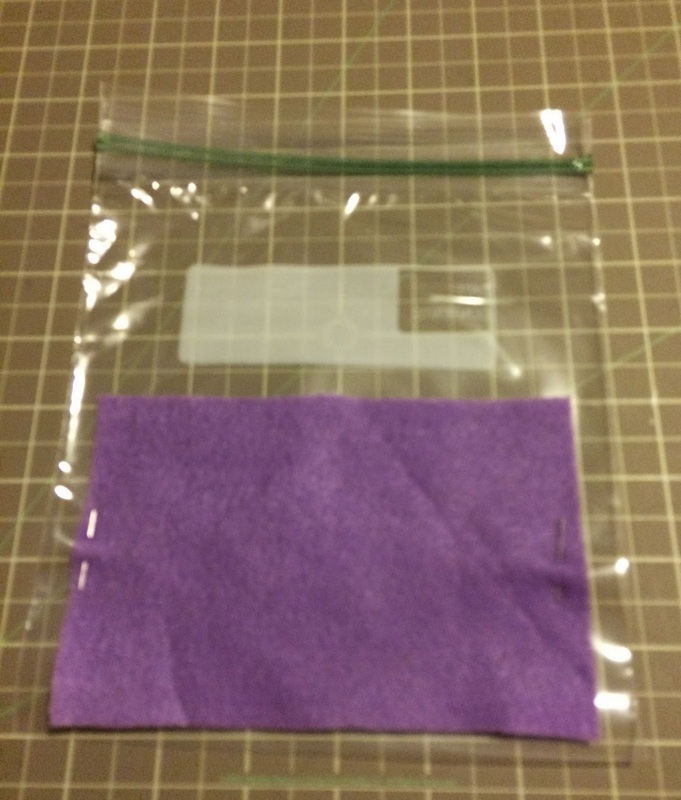 Use the back frame pattern to cut rectangle from the ziplock bag. Place Top Frame on top of clear sheet and sew around inner rectangle. Place Back Frame, clear sheet, then top frame underneath where you ironed on the words in step 2. Pin in place and sew the sides and bottom of the frame to the sheet. You want to leave the top open to slip in the picture. Print out Numbers Page Template. Cut a piece of fusible web large enough to cover the page. Place printed paper under fusible web. You should be able to see the printed paper through the fusible web. Trace the letters and numbers. Trace an extra "5". Cut the word "numbers" and each number apart (you should have 2 sets of numbers 1-5). Place the "numbers" word on top of the purple page and iron on. Let cool slightly then cut the letters out. 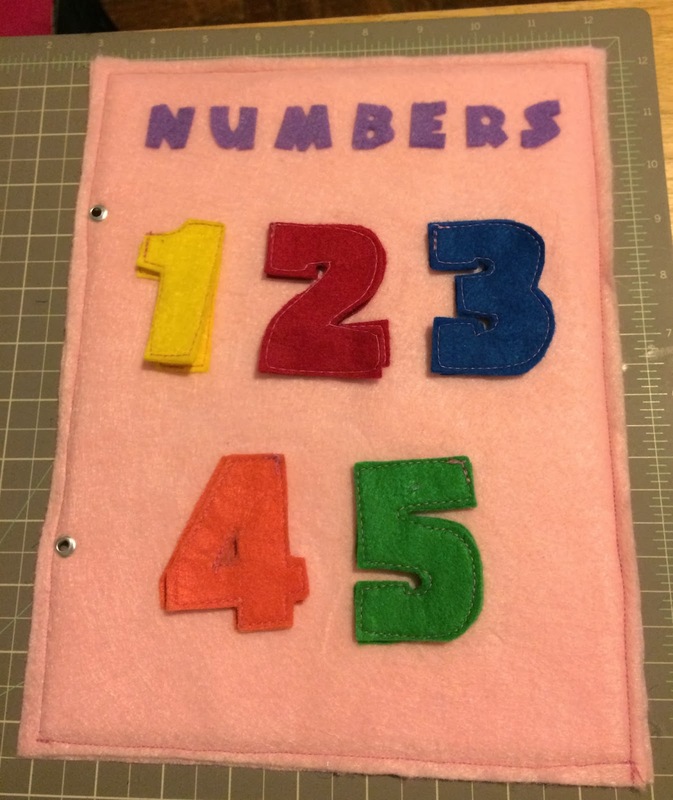 Place each number on top of a different color of the pages (except for the pink). You want each number to be a different color (make sure you use the same color for each number. Like all the 1's should be red, etc). Iron on, cool slightly then peel paper. Going down another 1 1/2 inch from the "numbers" word iron on the 1, 2 and 3. Going down about 2 inches iron on the 4 and 5. Using a sewing machine, sew around each number with a straight stitch. Cut Velcro into about 1/2" squares and peel off paper from one side. Press on to the middle of each number. 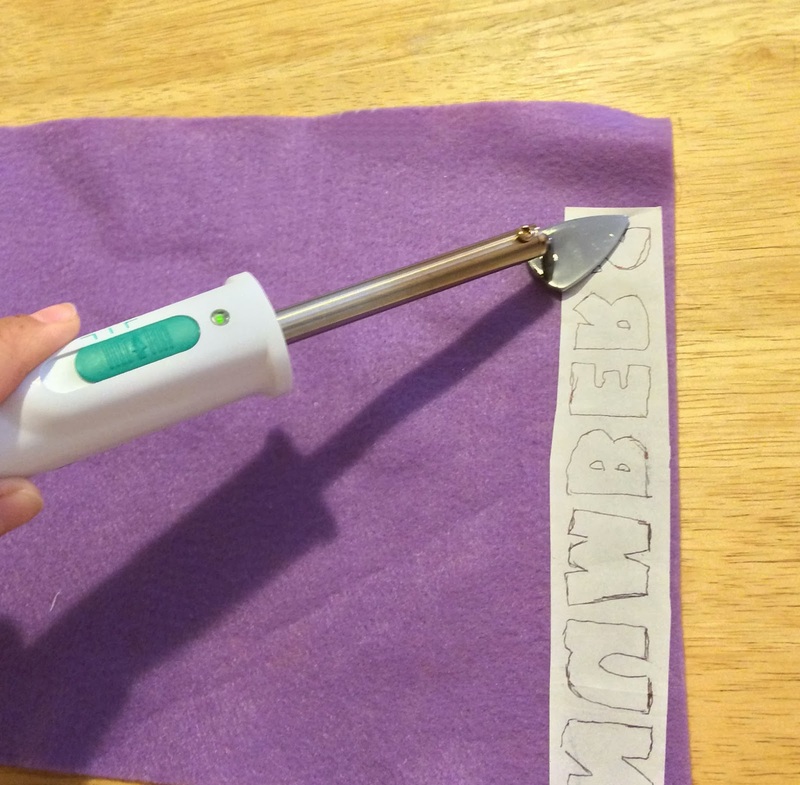 Take each remaining number and iron on to a piece of felt the same color. Cut around the number so that now you have a number with two layers. Sew around each sandwiched number using a straight stitch. Peel off remaining paper from each piece of Velcro and press it's loose matching number on top. Now when you peel off the loose number it should have the other piece of Velcro attached to it. Take the two completed pages and sandwich them together. The picture page should be on top and the numbers page behind. Stitch a 1/4" seam around 3 sides of the two pieces of felt. Attach to the title page using the rings. ** Stay tuned for my next tutorial where I will be making a page for numbers 6-10 and a shapes page. Such a cute idea :) Looks easy too! That is a really cute idea. I might try this for my little niece. I love the idea of using a sandwich baggie here for the picture pocket, I wouldn't have even thought to do that! This is such a cute idea! I need to try this for my kids! What a great project for kids! I really need one of those mini hand held irons. I didn't even know something like that existed. lol out of the loop! I love using felt in craft projects. It is so easy to work with. What a cute craft! My kids would love this, thanks for sharing! This looks easy enough to do! I love crafts that are educational! This is really cute and does look easy to make! Saving! This is so nice! I love that you made this and I love how you are making your very own book. You are giving me an idea of making our own little book with the kids. Sounds fun! Thank you for sharing. This is an awesome idea! Not only would this be a great learning item for my toddler, it would be super fun for her to help me make! Possible rainy weekend activity? I think yes! Thank you for sharing! Ooo - I need to get one of those iron gadgets....not that I have a specific craft to do with it....but I just want it.. This is a cute craft. I love the idea. I would like to make one for my daughter to play with in the car! This is a cute book. I love that you made it, such talent. You're so crafty! This would make a very nice gift for a new mom, mom to be, a family that homeschools...there are lots of things you could do with this book. My grandmother made this for my daughter on her 1st birthday and we LOVED IT. I always wondered how she went about making it. Thanks for the tutorial. Oh, homeschool moms would love this! This is a fun way to teach kids. Going to pin it! I love how this turned out! This is so cute! 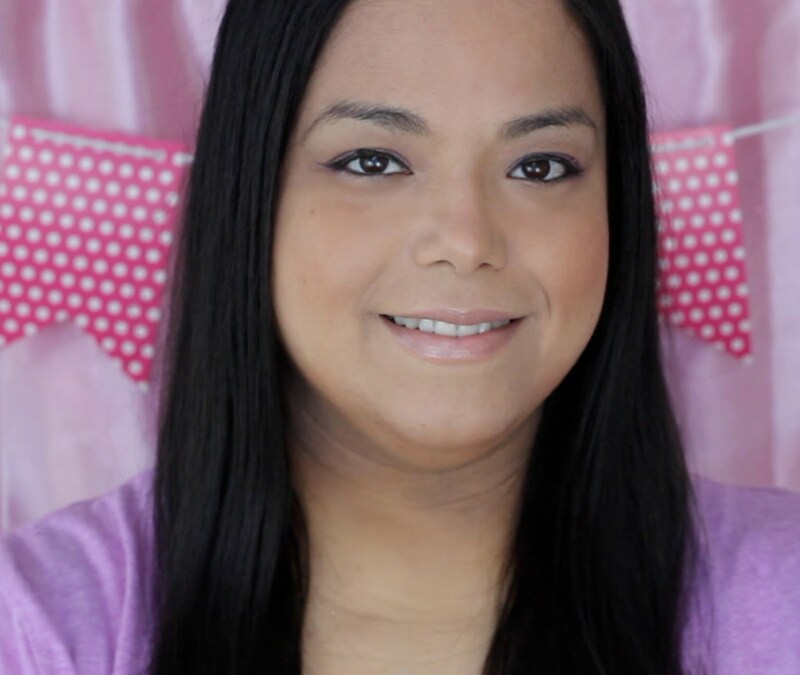 As a former preschool teacher, I think this is a wonderful project! That is really a fun craft.. My kids are older so they would have a digital quiet book.. This looks like such a great way to personalize the child's learning. Thanks for sharing. What a great tutorial. That looks like a fun book to make. what a wonderful idea, as a homeschool mom I am all about educational fun. This is great for on the go! How cool. I will definitely have to make these with my daughter. Thanks for sharing. What an awesome idea, cute too. My daughter would love this. This idea is adorable. My daughter would love it. What a cute idea. Where in the world did you get that tiny iron......I wonder if a hair flat iron would work lol! What cute little crafts. Love that you call it the Quiet Book. This looks really easy to do. Thanks for sharing! this is brilliant. so creative. my darling daughter enjoys doing crafts like this, too. This quiet book of yours is even an activity book. How nice.